I blame the Reventon for a lot of things; mainly for ruining the silky smooth lines of the Murecielago and Gallardo after it inspired their facelift designs. Another thing it brought about was an onslaught of super-limited, million dollar “special edition” Lamborghini’s. 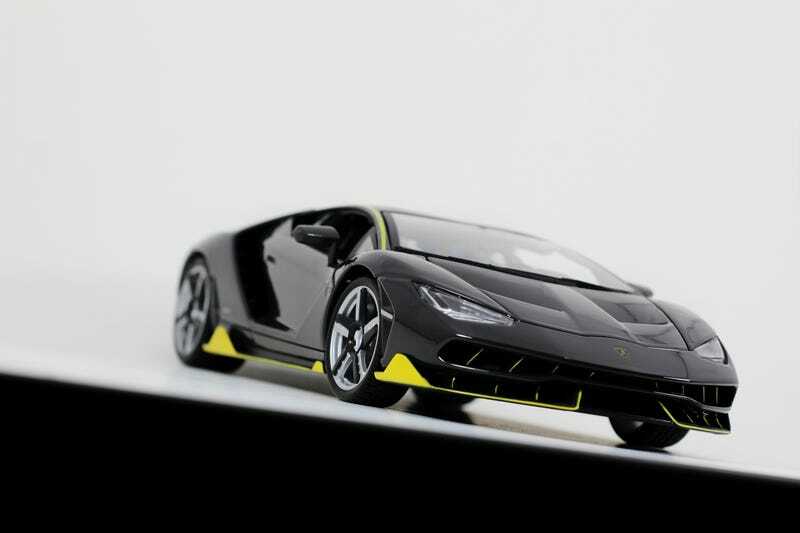 After the Reventon, we got the Sesto Elemento, Veneno, and most recently, the Cenenario. It’s release coincided with Ferrucio’s 100th birthday, and was limited to 40 examples. Production was split down the middle with coupes and convertibles. 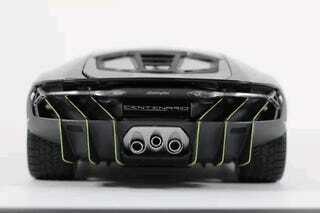 Based on the current Aventador, Lamborghini bumped up the car’s V12 to 760 horsepower. It’s ridiculous acceleration matched it ridiculous looks, sprinting to 60-mph in 2.8 seconds. You guessed, this was another $15 Maisto score at Costco. This was the one model I specifically went out hunting for, because unlike the older Diablo models I’ve shared this week, this one is very impressive. First, we get to have some fun with GIFs and demonstrate the active aero wing on the back of the car. This ain’t your Dad’s Maisto, the details are smooth and crisp. No mounting post on the lights and no wonky tire alignment. Sure there’s some orange peel in the paint, but I couldn’t even respray this thing for $15. One of the three exhaust ports is a touch off if you really wanted to pull out your tiny laser level. This year’s batch of Costco specials include a red paintjob. I’ve seen yellow and blue cars online too, but I’m not sure if they’ll be available at your local wholesale club this Fall. $15 man, can’t get over it!